Modern Ready to Assemble (RTA) cabinets are available at affordable prices. Once you put them together, you would never believe that they were not custom made for the kitchen. These fantastic cabinets are not just affordable, they are beautiful, and practical. 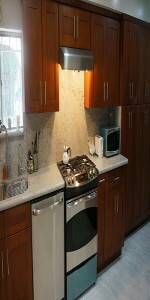 Every kitchen renovation project requires a budget and the budget always seems to exceed. Find solution of this problem with modern RTA cabinets as they are affordable and within most kitchen remodeling budgets. Whether you are a homeowner looking for an inexpensive upgrade or a flipper looking to make money on the sale of the house, you will be happy with the finished look of RTA cabinets. They are available in a variety of finishes sure to please any homeowner or potential buyer. RTA cabinets are available in a variety of finishes because every home owner has different tastes. Some love the rich look of dark espresso cabinets while others are into the clean crisp appearance of white. Both light and dark finishes can be amazing choices with the right lighting and design. These cabinets have solid wood doors made of either oak, rubber, maple, or walnut. You won’t be disappointed with the durability of any one of these types of wood. You can choose from flat panel doors or the popular shaker style. RTA cabinets have that high end appeal with soft close doors and drawers. They are available in many different sizes and functions. You will need to evaluate the kitchen to see what will fit. For example, how many lower cabinets with drawers will you need? Is there a corner that will need a space saving corner cabinet? What about the door jams; are they in the way of installing a cabinet or opening a door? These questions and many more will be answered when you take your measurements. Measuring is the most important step in installing modern RTA cabinets. It does not matter how affordable the prices are, if the cabinets don’t fit, they were a waste of money. Take advantage of the online templates and tools that will help you get the exact measurements that you need before you buy modern RTA cabinets at affordable prices.